oktober 2009 | 625 blz. 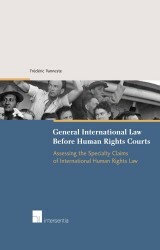 This book analyzes how the European Court of Human Rights (ECtHR) and the Inter-American Court of Human Rights (IACtHR) deal with general international law. In the light of the concerns of various authors about the fragmentation of international law and the “human rightist” aspirations of human rights law, the question arises whether these human rights courts put the unity of general international law into danger.